Say you were walking along an empty-for-Delhi path through a park and you came upon this place. What would you be reminded of? 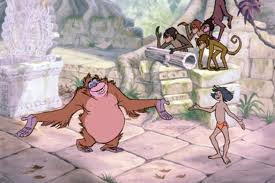 Me, I thought of the Jungle Book and I wondered where King Louie was. It's just marked as "enclosed tomb". Nothing else memorable, and there's not much care for it's preservation. Even with all the trees and plants trying to take over, so much detail is still preserved all these many years later. And nobody else is there to appreciate it. Where are the monkey's at least!